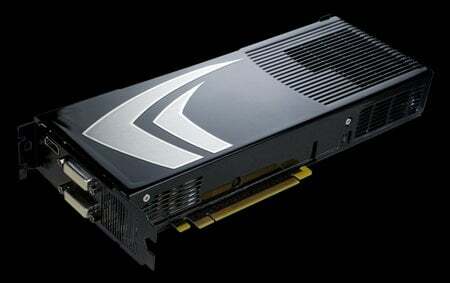 Nvidia has rolled out what it claims is the "fastest graphics card on the planet", the GeForce 9800 GX2, as expected. The GX2 contains two 'G92' GPUs, each with 128 unified shader processors running at 1.5GHz - the chip as a whole is clocked at 600MHz. The two GPUs connect to 512MB of GDDR 3 video memory running at 1GHz. The dual-slot card delivers a fill rate of 76.8bn textures a second, Nvidia claimed - more than three times the 20.8bn t/s rate the recently released top-of-the-line GeForce 9600 GT can manage. The GX2 has an SLI connector, so you can connect a pair of them on a suitable motherboard and get the graphics processing power of four GPUs. If you're worried about the power drain when you're not gaming, Nvidia said its Hybrid Power system means you can power down the GX2 when it's not needed and use and integrated GPU instead. Which is a nice way of getting punters to buy even more Nvidia product, we suppose. The boards have a pair of dual-link DVI ports and an HDMI connector to drive an HD TV. Expect a raft of product announcements from board suppliers in due course. Expect to pay $600-650 (£299-325/€380-412) for one. If Nvidia runs as anticipated, this time next week it will announce the GeForce 9800 GTX, clocked at up to 675MHz with the memory at 2.2GHz.